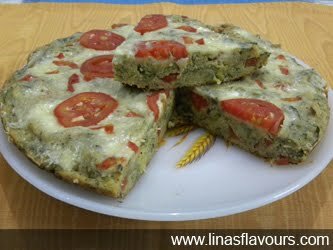 Frittata is an Italian dish similar to omelette which is enriched with cheese, vegetables and pasta. I have tried this eggless. Take a bowl. Add rice flour, cornflour, oregano, black pepper, green chillies, ginger paste, salt and mix it well. Add spinach, carrot, cabbage, tomatoes and mix it well. Add water as per the need and make thick batter. Take a pan and heat oil. Pour batter and spread it evenly. Close the lid and cook it on medium flame for 8-10 minutes. Open the lid, sprinkle cheese and arrange tomato slices. Close the lid and cook it on low flame for 10 more minutes. Check it after 20 minutes by inserting the knife, If it comes out clean and it is done otherwise, cook it for 3-5 minutes more. Cut into slices and serve it immediately. Note: Omit cheese if you are enjoying as a low fat. You can even prepare it beforehand and reheat before serving. This can be stored for a day.